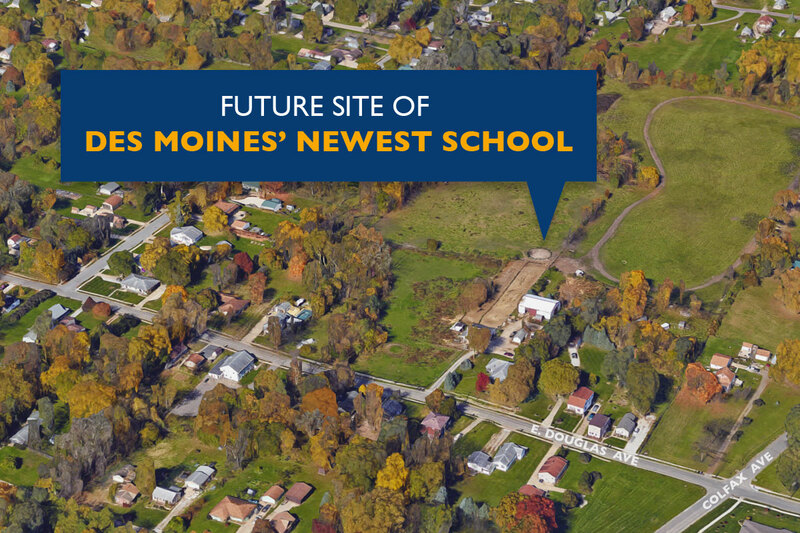 Des Moines Public Schools is beginning the process of purchasing an 18 acre parcel of land at 3260 E. Douglas Avenue. Des Moines Public Schools is taking the initial step to open a new elementary school. The new school would be located near the intersection of East Douglas and Colfax, and is being planned as a PK-6 Montessori school that could serve up to 450 students. The School Board will consider a resolution at its November 7 meeting to schedule a public hearing on November 21 on the purchase of property. The property is just over 18 acres with a negotiated price of $595,000. If the property purchase is approved, the preliminary schedule for the project is to begin planning and design work on a new school this winter, with site work to start in April and construction to begin next Fall. Community meetings with the neighborhoods that would be served by the new school will be scheduled as a part of this process. The current hope is that the school would be completed and opened in time for the 2020-21 school year. Funding for the purchase of land and construction of the school will come from revenue DMPS receives from Secure an Advanced Vision for Education (SAVE), the statewide one-cent sales tax in support of school buildings and facilities. DMPS currently operates the only public Montessori school in Iowa at Cowles in Windsor Heights. The new school would be the state’s second public Montessori school. The Montessori method of education, developed more than 100 years ago, is a child-centered approach based on scientific observations of children from birth to adulthood, and has seen success in diverse cultures throughout the world. Montessori focuses on the development of the whole child—physical, social, emotional, and cognitive. “The opening of this school as a Montessori school will be a significant addition to the educational offerings at DMPS, and a welcome addition to best serving more students on the east side of our community,” said Susan Tallman, executive director of elementary school at Des Moines Public Schools. The new school will also help alleviate space needs at two elementary school in northeast Des Moines – Brubaker and Garton – which have seen steady increases in students as well as programming. DMPS is also addressing growing enrollment in southeast Des Moines with the addition of four new classrooms and a new gymnasium at Jackson Elementary School.